"At Amerisite Land Survey, L.L.C., I can efficiently survey your property single handedly utilizing a Leica total station robotic theodolite. In my opinion, Leica robotic instruments are the best that money can buy. This technology is so advanced that the telescope of the instrument automatically follows the prism that is held by a person hundreds of feet away from the instrument. This allows for one person to perform the survey that would typically require two people. At Amerisite Land Survey, L.L.C. you get the benefit of having a licensed land surveyor with over 30 years of experience on your property in the field to personally collect the data, and make decisions in the field. This saves time and money. Most companies do not send a licensed land surveyor to your property during collection of the field data. At Amerisite Land Survey, L.L.C., you get award-winning drafting services utilizing the latest computer aided drafting software to produce professional quality plans for submittal to planning boards or the registry of deeds." Former US Army Sergeant Randy Donckers, Field Artillery Surveyor of 25Th Infantry Division based at Schofield Barracks,Oahu,Hawaii, performing real time simultaneous intersection survey for F15 fighter jet's bombing practice on the volcanos of the "Big Island" in Hawaii. Amerisite Land Survey, L.L.C. was established in June of 2011 by Randy J. Donckers. 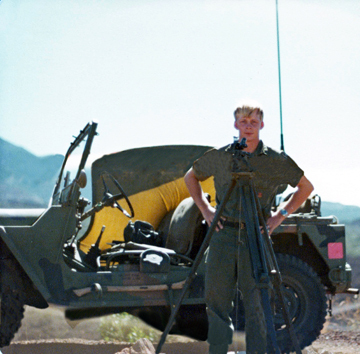 "Born and raised in New Hampshire, I decided to start a land surveying career with the United States Army in 1977, where I attended the army's advanced individual training school for land surveyors. While performing the duties of a field artillery land surveyor in Wahiawa, Hawaii, I received the Army commendation medal for scoring higher than 99% of my land surveying peers army-wide on the surveying skill qualification test. I have continued my surveying career for over 30 years, and I have become skilled in all areas of land surveying including computing coordinate geometry, drafting boundary, septic, and subdivision plans, property corner layout, construction layout, land planning, zoning regulation review, and planning board meetings. I have held a land surveyor license in New Hampshire since 1989, a professional land surveyor registration in Massachusetts since 1994, and a designer of subsurface disposal systems (septic systems) in New Hampshire since 2002. I have also been a member of New Hampshire Land Surveyor's Association since 1995." Mission statement:"It is my goal to provide my clients with the highest quality land surveys within a time frame that meets my clients schedule at a reasonable price." 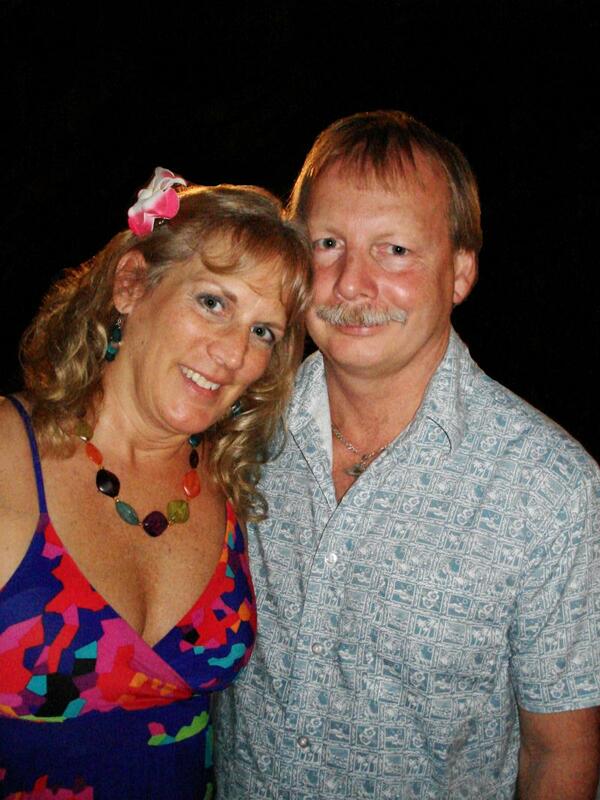 Donna & Randy Donckers at the Luau on the "Big Island" in Kona, Hawaii in 2011.